PJ and his coaches at The Wakeboard Camp have put together the most thorough DVD instructional series to date. The series is structured to show viewers the genetics of each trick, how it builds and breaks down, and the relationships of tricks between the base trick and the goal. This DVD is the most in-depth look ever at the 8 base inverts. It even shows different versions of the same inverts to help you prepare for variations of these tricks found in the "Intermediate & Advanced Inverts" DVD. It will also show you how to use the trampoline to make the most of your off-the-water training. You will learn how to dial in your inverts and rotations, and build muscle memory through repetition. State of the art digital imaging, multiple camera angles and several perspectives on each trick, make this DVD a must have for anyone wanting to get the real skinny on inverted maneuvers. As we move on in the spring and start thinking about summer, it's time to make sure your technique is on the right course for good progression. The Book DVD series is the best instructional source ever. The concept of The Book DVD series was to take all the knowledge accumulated by the Wakeboard Camp coaches and put it on a DVD series. This isn't just one crammed instructional DVD, this is an in-depth and detailed set of DVDs that breaks down tricks like never before. It also features groundbreaking digital work by DVD creator and pro rider Mike McLin. The book is all digital, and although I love film, for an instructional video I'm not really looking that much for scenic shots. Plus, since the total Book series is over eight hours long, that'd be obscenely expensive with film. The angles are good, and being able to see tricks in split screen with different stances or different styles of the trick is fantastic. Does eight hours mean anything to you? There is PLENTY of footage in the Book series. You can also purchase any one of the five DVDs individually if you're only looking for help in one area. The riding in the Book is extremely fundamental, and filmed for the purpose of showing great form when performing tricks. The riding quality is also top notch with some of the best pros in the sport. What strikes me about The Book is how well everything is broken down. Each trick is broken into sub-tricks that are taught in detail. I've never seen instructionals that show you four "drills" to do on the water to get used to the edging and body position used in a trick. I'd bet most wakeboarders have never even thought in these terms, and it's the kind of revelations you'd normally have to pay a lot to get by attending The Wakeboard Camp. After the equipment section, they will take you through boat driving, boating safety and getting ready to ride. To finish up, you will learn the basics of getting up and riding your board behind the boat. In this DVD they concentrate on teaching you how to build a solid wakeboarding foundation. Every trick in wakeboarding, no matter how complicated, can be broken down into its most basic parts. Using drills developed at The Wakeboard Camp, they will help you to eliminate variables that can complicate the learning process. 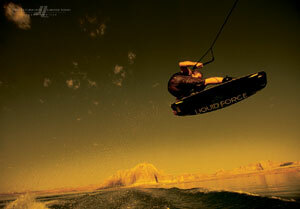 This DVD includes everything you need to know about spinning ON and OFF axis on a wakeboard. They start out with "On Axis" spins from the most simple 360s, all the way through 720s. Then we get into "Off Axis" spins. Starting with Off Axis 180's and taking you through Off Axis 900's. You'll also see every single spin on the trampoline, and give you tips on how to grab various spins. This DVD will tell you everything you need to know about how to do some of the most advanced inverts being done today. Included is virtually every popular 180 and 360 invert. We'll also show how to do different variations of the same trick, and even how to grab the most difficult tricks. Split screens, multiple camera angles and tips on how to use the trampoline, all make this disk a valuable tool in learning advanced inverts. The Book is simply the best instructional ever made, and should be in the DVD collection and used often for any wakeboarder who's looking for extra help on how to improve on the water. Reviewed by: Pat McCarthy As we move on in the spring an ..